We traveled with 4 kids so needed a condo big enough to accommodate all of us. This condo looked perfect for us as we were narrowing down our search. When we arrived, the condo was even better than we expected it to be. It was right on the water where we could relax every night as the kids went to bed and every morning before anyone was up. It is much more private than I expected as well. We enjoyed all of the pools on the grounds and the amenities in the condo. We used the chairs and body board daily. Thank you so much for an amazing stay, we will book this condo the next visit as well. Amazing View - great sunsets! Lots of extras in the kitchen set-up, bonus for dishwasher, garbage disposal, blender, extra garbage bags, soap. Its literally like moving in and having everything that you would ever need! Even kids sand toys, chairs, tennis equipment, coolers, card games, clay molding set for kids. Rooms are big - I loved the master room with spacious double head shower sprayers and the Vanity! I did NOT WANT TO LEAVE. Condo is located just down the hill from grocery store, and a short drive to beaches with great snorkeling! I like that the condo had 3 pools to choose from and a grilling station located at each. Nicely outfitted. Lots of food staples. Great appliances and bathroom facilities. View is terrific. Minor maintenance needs: Screen at front door needs new pneumatic slam preventer, Sliders to lanai need adjustment and cushions on couch need replacement. Had great stay and have signed up for same time next year. Although there are a few things that could be improved, such as the carpet up the stairs and in the upstairs loft needing to be spot cleaned, and the master mattress having a sinkhole that makes sleeping uncomfortable, the view of the ocean and the sound of the waves is unbeatable and makes this place a definite five star home! Other than the carpet stains, the condo was very clean and the whole complex itself was clean and beautiful. The owners were very responsive when we had questions. If we go back to Kona, we would definitely rent this place again. The view was spectacular, the condo was large and clean, the appliances looked new, the kitchen was well-stocked, the furniture was comfortable, and the location was convenient. My one complaint is that the master bedroom was pretty noisy. The louvre windows offered zero soundproofing so we heard people walking by, talking on their balconies, dumping their trash, shutting car doors, and driving by. Other than that, we really enjoyed this condo and would recommend it. We stayed at Kanaloa at Kona, Condo 2003 for over a week during our first trip to Hawaii. The place was decorated and appointed very nicely, set up with everything we might need. The location was great, overlooking the water and close enough to hear the waves at the shore, beautiful sunsets, plenty of restaurants within a short drive. Would happily stay here again on our next trip to the Big Island. We had a wonderful time and the condo help provide us with a relaxing and enjoyable stay. The condo was well stocked with many items you don't find in many condos. We especially appreciated the condo being ready for us when we arrived, a quick check-in for the gate pass and the lock box made it quick and simple. The living room recliners were the hit for enjoying our time indoors. Kanaloa at Kona is a great community with your chose of pools, easy access to barbecues and the close KTA grocery store. The sunsets were spectacular from the lanai. The shade on the lanai was an extra bonus in the afternoon. This was the first trip to Hawaii for our son and daughter-in-law and they had a great time. This condo was everything you could hope for in an oceanfront locale. The waves broke right outside the unit and delivered equal parts great visuals and relaxing sounds. Inside the ac was super and made cooling off easy after a hot day exploring the island. The unit was well equipped and had a full cable service allowing us to watch college football at 6am!!! Everything was super clean, comfortable and we’ll definitely be back. Condo 2003 was everything it promised to be. Comfortable, clean, great amenities, beautiful view and terrific location to serve as a base for exploring the Big Island. The Kanaloa grounds were lovely, and the multiple pools and tennis courts were beautifully maintained and never crowded. I would recommend the condo to everyone and certainly would look to stay there again if back on the Big Island. Terrific location and very stylish condo!!! We traveled to the Big Island and arrived very late to the condo. However, this was not an issue. The owner of this condo has effective line of communication and made this a non-issue. Before we arrived, we had received a detailed email. Also, inside the condo was a binder full of useful information and advice. The security guard was very helpful and helped located the building. As we walked up to the condo in the dark we could hear the ocean waves. Wow! The nicest surprise was we had stopped at the Safeway on our way in (its open 24 hours thank goodness!!) however, this condo had nonperishable items in the cupboards. Salt, pepper, spices, coffee filters etc. That was a nice bonus! This wasn't a guarantee, but it was welcome surprise. The kitchen is stock with anything you could need to cook a meal. We went to the farmers market on Ali'i Drive which is nearby, meaning this condo is in a terrific location! When we drove through out Kona we passed several other places we had considered renting, and honestly, we are so glad we went with this condo. No parking on a main road, parking spot is covered. The condo is in a quiet and secluded location. Super clean, quiet, well maintained property and the view!!! We ate all our meals out on the balcony and honestly, one of the reason why this condo made the list (and I know it sounds silly) but this one had the loungers. All I wanted to do was to lay on them while drinking my coffee and watch the ocean. My husband and I did this every day and night. I just laid there on those loungers. Our plans took us all over the island (minus volcano Park :( and at the end of each day it was nice to relax and unwind at this condo. The other benefit of renting this property were the pools. Now, I didn't think we would ever use these pools however, one day the waves at the Sandy beach were too powerful for our three elementary aged kids. It was nice having the two kid friendly pools as a backup. Overall, the property looks exactly what you see in the pictures. If we ever came back this condo would be it and nothing else! The views from the condo and Lanai are gorgeous! The condo is well maintained and the kitchen is very well stocked with quality appliances and cookware. Beach chairs, an umbrella and cooler were included and so appreciated. We brought our own snorkel equipment and water shoes but they were available too! We would definitely stay here again and can highly recommend it! I just returned from nearly 3 weeks at Kanaloa. This was at least my 10th time staying at a condo at this resort, but my first time in unit 2003. This condo was great. The view is fantastic and the condo has everything you would expect and then some. We had one small issue with a TV, but a quick call to Ken the local rep got it resolved. The resort is immaculately maintained, and the staff is friendly and very helpful. I highly recommend this resort and unit 2003. I plan to return again Jan/Feb 2020. We throughly enjoyed our stay at Kanaloa Condo #2003. Our trip was pure detoxification for the family. Hiking; zip lining over Akaka Falls; touring the Kona Brewery; touring Mountain Thunder coffee farm; Volcano City; kayaking and snorkeling at Capt. Cook Memorial all while staying at condo with the waves crashing outside our windows 24/7!!! Condo #2003 was well located and comfortable. All amenities were at our fingertips and help was only a text/phone call away...Thank you Brandon. Only issue was the fact that I couldn't get ESPN on the family room TV. Thus, I had to watch the college bowl games (Rose Bowl/Sugar Bowl) in the bedroom. I know 1st world problems! Nevertheless, we would stay at condo #2003 again and again and again...thank you Mhari---5 star rating!!! What an amazing condo to spend Ironman Kona in! Right on the ocean, great amenities, pool, and not too far from Ironman festivities. Perfect for my family of 4. Thanks for a wonderful week! Very Nice Condo and everything was as described. This is a great location right on the Ocean with beautiful Sunsets. We had a great time. We were there for my wife's 65th birthday and we had a great time. We will definitely stay here again. We had a lovely stay at the condo with four adults. The view from the balcony can't be beat, and we got to see incredible sunrises and sunsets from there. Everything in the condo was well equipped, from kitchen to bathrooms to snorkeling gear. The place felt very secure and we wouldn't hesitate to come back and stay again. Beautiful home with great lanai! We stayed at this condo for 6 nights and it was beautiful. Everything you could ask for was at this condo. They had beach supplies, beach towels and we loved the cooler and ice packs. We packed many a picnic lunch. The washer and dryer inside the unit was perfect and the condo itself was very spacious. The master bathroom is huge and loved the shampoo, conditioner and soap in dispensers in both showers. There were 4 of us and we had tons of room. We saved money by cooking several meals in the well equipped kitchen and the lanai was perfect!! We watched the spinner dolphins put on a show our first morning there and loved watching the manta dive people every evening along with sunset. We felt very centrally located to all the thing see wanted to do and even running over to Hilo (which we did 3 times) was no big deal. I will definitely mark this in my favorites and hope to return for a longer stay. My only word of advice is stay here last on your Hawaii stay, anything else will be a disappointment after this wonderful condo and property. Thanks so much for sharing!! We stayed here in August of 2017. The view from the deck is absolutely stunning. Waves crashing over the rocks, with the most impressive sunsets I have ever seen! It was truly magical every single night. The condo is well stocked with beach towels, boogie boards, snorkel stuff for the kids... Everything we needed for a great time on the big island. And, the location is fantastic especially for captain cooks snorkeling as well as the manta ray experiences at night. In fact, you can watch all the manta ray boats from the deck nearly every night. Comfy beds, with plenty of room... We'll definitely be back! Mahalo! The location of this condo was great. Not too close to Kona but close enough The kitchen was well-equipped but needs an overhaul of its supplies. There were too few towels when we arrived but the management took care of that. The view from the lanai was spectacular. The place is great, but to get back to being 5 star the cupboards need to be re-faced, appliances updated, wall hangings updated, quality of provisions (like TP) upgraded. If I could have given this condo 6 stars, I would have! If you are staying on the Big Island, you need to look no further. This property has everything you need to make your family vacation perfect. The owners provide beach chairs, boogie boards, even sunscreen and aloe if you need it!! The kitchen has every pot and pan you could possibly desire and the washer and dryer was just what we needed. And I haven't even mentioned that amazing view!!! OMG!!!! Our family enjoyed everything about this condo. It's very spacious and is equipped with everything you'll need and even things you didn't think you would need. We loved the location, very nice neighborhood and you could walk to grocery store. From coffee on the lanai, watching the night manta ray charters, swimming in the 3 pools, the list goes on and on!!! We will definitely stay here again!!!! Condo sets right on the beach. You will literally be awaken by waves slamming on the coast. Condo is very nice with everything you need. It has gated entry to the condos. Super quiet. The prime purpose of this vacation was to decompress, relax and rest. The lanai of unit 2003 was the perfect place - the beauty, the breeze, the comfort, the view, and most of all, the sound of the waves crashing on the lava - perfection! I read 5 books in a week! The inside of the condo was great, too.We would love to return. Unit 2003 was every bit as nice as the description made it sound. We found the unit clean and very nicely equipped. There were also plenty of towels, soap for kitchen/dishwasher/clothes washer, coffee filters, etc. We ate all our meals at the condo to save money. Really, the only negative for our group was that the third bedroom is not very private and those staying there must go downstairs to use the bathroom. This was described on the website so my point is just that this unit is probably better for 4 adults and 2 kids rather than 3 couples. This unit is very conveniently located both in terms of being right on the water and in terms of easy access. From Kona and points north you can take Hwy 11 to get there quickly. A complete shopping center is very close by but just far enough away that you don't notice it unless you go there. One last very fun thing to do.... a short walk from the condo is the Keauhou Canoe Club. They are very friendly and offer morning paddles for no charge. If you've never paddled an outrigger, this is your chance. Just show up in a bathing suit - they supply the paddle, a big boat you'll share with experienced members, and instruction. Be sure to hum the Hawaii 5-0 theme only to yourself! Wonderful views. Very relaxing. We spent a lot of time on the balcony just watching the waves crash on the lava beach and enjoying the sunsets. We spent the first half of our stay on the Big Island at this condo, and feel extremely fortunate that we did! The condo is very comfortable, and spacious. It has many details that other accommodations may not include, like a laundry basket in every bedroom closet (we have four kids, so details like that matter), beach equipment, like umbrellas, coolers, water shoes, etc. (Things you probably can't bring along from the mainland). The bathrooms were large and had soap, shampoo and conditioner provided. The showers were very high quality. We never ran out of hot water. The very best part of this outstanding condo though, was the lanai. We sat every morning with coffee and watched the ocean roll in, boats go by, paddle boarders paddle by, etc. It was hard to leave at the end of our stay. One last note is that the location is perfect. We went to Hapuna Beach on two different days, and it was an easy drive. Also, went to a luau at the Sheraton, which is about 5 minutes drive away. Snorkeling cruise was about 2 minutes away. There's a little strip mall with restaurants, Long's Drug, grocery store, book store, etc. 5 minutes away. If we go back to the Big Island, we will make every effort to return to this condo! Beautiful, well furnished and comfortable condo. The kitchen is well appointed for cooking in. The view was mesmerizing. Saw an early morning school of about 100 porpoises. This was our third time returning to this condo and, once again, we had a fantastic stay. The condo is extremely well equipped (including great recreational equipment), comfortably and tastefully furnished and very clean. The view from the spacious lanai is second to none! The resort itself is fabulous and in a great location within walking of great snorkelling, kayaking, paddle boarding, grocery store, movie theatre... but away from the more congested areas. This condo provides everything you need for true fun and relaxation! Booking arrangements and communication with the owner were very smooth and friendly. We had a problem with the WiFi this time which was addressed immediately. (first time we have had any problems at all! )We highly recommend this condo and look forward to coming back! Home away from home! We had everything we needed for a perfect vacation. This is a spacious, well appointed unit. Everything was in good working order upon arrival. We have rented other condos at Kanaloa, and this one is equally nice. The view is fantastic, and we had many happy happy hours on the lanai. The master bedroom/bathroom is updated and very nice. Second bedroom has twin beds, which was good for our grown kids, who joined us later in the week. The loft bedroom has an L shaped day bed combo, but the kids preferred the mattresses in the downstairs bedroom. It was unusually warm the first few days of our stay, so we had Ken come turn the air conditioning on. It was definitely worth it! On previous winter trips we didn't need it, but when we did, we did! I noticed other reviews mentioned problems with the a/c; it has been fixed and worked perfectly. I appreciated all the gear that was supplied: Beach chairs, umbrellas, snorkel masks and fins, coolers, beach towels, water bottles, totes...all the beach things you don't have enough room for in your luggage! Washer and dryer worked great. Kanaloa is well situated just south of Kailua, so you're not in the traffic of town. The nearby shopping center was great for daily needs, and we started with a Costco run on the way from the airport when we arrived. Mahalo Mhari, for sharing your lovely condo with us! This condo view does not disappoint ! Truly glorious and could not be better. Condo is very clean , well appointed and well maintained. We did have issue with AC going out, however Ken was great and did all he could. Our AC fee was refunded - although we would have rather had it but would not trade this condo view for anything. We would definitely rent again! Beautiful condo and awesome view! We stayed during the beginning of November in this lovely condo. The view was absolutely fabulous. There were so many little details that made this condo special. The kitchen was fully stocked, even with Tupperware so we could take snacks to the beach. There were beach chairs, umbrellas, beach towels, snorkel equipment and a small/large cooler that we used daily. The onsite manager was friendly and quick to respond to a wifi question. The owner was also extremely helpful and gracious with a booking question. This condo is in a perfect location, close enough to all the action but off the road so it's also very quiet and relaxing. It was peaceful enjoying our morning coffee on the lanai and watching the day start (sun coming up, kayaks paddling, etc.). We would definitely come back to stay at this lovely condo!! This property has a great ocean view lanai that we really enjoyed. The unit has great amenities and is reasonably quiet. Pools and hot tubs enjoyable too, especially the ocean side pool. We used the BBQ close to the unit a few nights and it worked very well. Very clean and comfortable. The outside is a little weathered but to be expected for an ocean front property. Third bedroom is a loft upstairs. We spent 4 nights in this amazing condo. It was very clean and very well equipped. The ensuite bathroom was amazing. The lanai was huge and the sound of the waves right in front were fabulous. The furniture throughout was also very comfortable and in excellent condition - not at all dated. Loved every minute at this condo. The proximity to a barbeque was also excellent. We would not hesitate to stay here again or to recommend it to people looking for great place to stay in Kona. We had a wonderful time on the Big Island. The condo was exceptionally well maintained and had everything you could possibly need. The best was to sit early in the morning or as the sun was setting watching the whales out the front. The swimming pool and spa was wonderful for the boys. The condo is near a shopping centre & town but nice and quiet. A wonderful place to stay & we will be back next time we come to the Big Island. make sure you have an iced coffee at Donkey Balls and Annies burgers was exceptional! Snorkel at 2 steps and don't miss the black beaches! This was our second stay in unit 2003 - and it was wonderful! There was a bit of a problem with the A/C, but the owner worked diligently to get it taken care of, and offered to move us to another unit. We decided to stay, and while it was a bit warm at times - it is a great condo - with a perfect view and everything you need. We were reimbursed for the A/C inconvenience - the owner was a pleasure to work with. We had never rented a condo before, so we had some apprehension. Let me say this: Put all your fears to rest. All of the pictures from this condo that are on the website are exactly as shown. No bait and switch. Communication about directions and access was great. It is right on the ocean, just as the pictures state. Full kitchen with all amenities. Hugh family/living room with a large L shaped couch and extra chairs. Large dining room table. Outside lanai, a mere feet from the crashing waves. 2 full bedrooms and an upstairs loft. Full furnature in all rooms. The house came absolutely fully furnished. Extra towels, beach towels, beach gear (umbrellas, snorkeling gear, chairs, ice cooler). Hugh master bathroom with 2 shower heads, large enough for 2 (and some), separate area for the toilet, and a large sitting area for getting ready in the bathroom. 2nd full bathroom great for the kids. A/C was awesome. Plenty of cooling power. TV in living room and master bedroom. Secure WiFi in the condo (cause work did intrude a few times). Fully equipped kitchen, especially since we stopped at Costco and loaded up to eat many of our meals there instead of eating out for every meal. Freezer put out a ton of ice, enough to keep using with the ice coolers for trips to the beach (and day trips to Mauna Kea and Kilauea. We were concerned as we were supposed to arrive 2 days after Hurricane Iselle. But we had no problems. Visited the pool area a few times and it was great. Didn't use the nearly BBQ's in the common areas, or visit the onsite restaurant. Did I mention it was right on the ocean? Just feet away? Like 30-40 feet maybe! It isn't sand--its volcanic rock with some walking paths. But this is Hawaii! The waves crashing against the rocks, and direct sunset facing west were picture perfect. The condo even came with extra, that you might not think of until you needed them. Washer/Dryer with detergent provided (no fabric softener, but we brought some dryer sheets with us in a ziploc bag. Extra trash bags, dishwashing soap and detergent. ziploc baggies. Kitchen had a good supply of spices, seasonings, and basic needs to go with the food we bought at Costco. It did come with a few rolls of PT and TP, and a box of kleenex, but we bought extra, given that we also had teenagers with us! A few recommendations: Have a separate can in the condo for recycling. The trash dumpers outside has a place for them, but if you don't plan ahead, you may be sorting while standing at the dumpster. Fabric softener for the dryer. And a TV in the 2nd bedroom. The covered parking is great for a small/mid size car, especially if someone is parked in their covered spot next door. We had a GMC Yukon, but found plenty of open spots right nearby for easier access. Wanna go to the beach? Go to Hapuna Beach, about 30 miles north. It truly is the best beach on the island, and in the top 10 of the world. It was worth the drive for the 3 day trips we made there. Gas? Go to Costco. 40-50c less than elsewhere!!! !Wanna bring back goodies for your friends/co-workers/family? Go to Costco! Hawaiian candies and macadamia nuts, way cheaper than anywhere else. Take some day trips and explore the island. And to go the Hawaiian Style Cafe in Waimea, where you will find some Man vs Food sized Pancakes!!! Will we come back? Sure thing! Just as soon as I build up more frequent flyer mileage. I traveled with my husband and two adult children to Kona in June and chose this exact property with the advice from Aloha Condos. I described what we were looking for and Aloha Condos found us the perfect spot! Kanaloa is great for tennis players, with 2 well maintained, lit courts. Our unit overlooked the crashing waves, it was spacious and comfortable, it was well equipped with everything from hair conditioner to cooking spices and beach gets. The unit and the ocean view from the lanai is even more beautiful than photos on the internet. I highly recommend this unit and Aloha Condos. Thank you to the owners and to Aloha Condos! Wonderful retreat! It's been 30 years since I last stayed at Kanaloa, but the property was very well maintained & updated. We had a lovely stay! Thank you for your feedback. My local staff has checked the thermostat for the central air conditioning and have updated the instructions for using it. The chaise has been replaced with a new one. Mahalo for taking the time to post a review. This is our third year at Outrigger Kanaloa. The first renting this unit via aloha Condos. I loved the ability to choose the unit based on photos/reviews/condo location. We were a family of four with room to spare. Pros: Well stocked kitchen, comfortable beds. The owners had prescheduled an appointment with the cable company to check the internet connection. They were fast and courteous. The manager was quick to respond to any inquiries. Lockbox key available for check-in.Kids were able to do snorkel, scuba class and then went out on cruise. Parasailing was a big hit, too!!! Plenty of kids in our group to play tennis. We cooked at the grill at the family pool. Made some nice friends! Cons: Would have been nice to have a Swiffer or other wetjet to do the floors. Also a way to turn down then air conditioner. Overall: Loved it. We seemed to get a little more complaints from "Owners" at the pool. We did our best to keep the kids quiet. Didn't have the guts to ask them why they didn't use the Ocean or adult Only pool. Hoping my husband can take a trip there alone next year. If your contemplating saving a few bucks by finding something a little cheaper, don't make that mistake. I have stayed in many condos in Kona and this is by far the best of the best. The view is incredible, the condo has everything you can imagine and things you wouldn't even think of. The aC is very strong (cost an extra 15 buck as day but electricity is very expensive)which is great for sleeping. The grounds are very nice and the location is safe. The internet was out during our stay but was a supplier problem. They are very responsive to any problems and I plan on returning. We came to the big island for our wedding and honeymoon and this condo was the perfect place. The location is great, the view is amazing, and the owner has stocked the condo with everything you could possibly need. It was completely perfect and so reasonably priced. Everything is very clean, and nicely appointed. We intend to return and rent the same condo again, without a doubt! Also, the owner will send you directions and instructions to access the condo that make it so easy. Everything met our highest expectations. Furnishings, location and service. A very welcoming home away from home. We stayed for a period of 9 days at this Kanaloa condo. It became very obvious to us that this was a property that was owned and maintained by somebody who loved Hawaii and wanted the guests to get the best possible experience from their stay here. Are you going out to the beach, but forgot to bring beach towels - no problem - it was providedWould you like to try boogie boarding - no problem - it was providedare you hesitating to go out because it might rain - no worries - the umbrellas are thereWould you like to go the farmers market and purchase something while you are there, but forgot to bring a bag - no worries the condo had themLikewise for picnic carry cases, the way the kitchen was organized and the appliances provided. The condo was spotless when we came in, and importantly felt inviting and homely. As a family with kids, we loved that feeling. The location was ideal. Wake up in the morning, open the curtains in the living room and the ocean serenades you. Be mesmerized by the show that nature puts on every day at sunset. Near enough for creature comforts but still amazingly quiet! Loved our stay and hope to be here again. Thank you very much to the owners of this condo! This unit is exceptional in many ways. Most important, it is mega comfortable! The sight and sound of the Pacific Ocean waves crashing against the lava rocks is unique and sensational. The owners provide everything you might need to enjoy your stay. The unit is spotlessly clean and the master bed a pure delight. There is even room for two in the huge shower! The attention to detail is very gracious and accommodating for every aspect. We had a terrific time! The location, within a walk to a shopping center, which has a movie theater, was an excellent accommodation. It is true what they say about "Location, Location, Location!" This one can't be beat! A great value in a delightful resort. Loved the setting, the decor, the amenities. Would definitely stay there again. Well equipped and fanatastic oceanfront views. Kanaloa at Kona Condo 2003 is well equipped for a memorable aloha vacation. We enjoyed the majestic waves from the lanai and spacious quarters. our grandsons loved the loft and we all enjoyed the amenities that Kanaloa at Kona offered. Have stayed in different condos at Kanaloa at Kona many times before and have usually found them to be quite noisy. Don't know if there was anyone else in the building this time but it was very quiet - just the sound of the waves - perfect! The condo was very well equipped with everything we could need. Well maintained and highly upgraded. Decor is the right amount of Hawaiiana without being kitchy. Call to local contact resolves any issue promptly.Only thing I could complain about was climbing the stairs, especially with luggage. I guess I'm getting too old. View, facilities, amenities could not be more perfect for a family of 6. Staying at Kanaloa at Kona-Condo 2003 was an incredible experience. From the sound of the crashing waves right outside the lanai, to the beautiful views both inside and outside the condo. The condo was well furnished and very comfortable. The master bathroom was 5 star! I would highly recommend this condo to anyone wanting a comfortable yet classy place to stay. This 7 day vacation was a Christmas present for three of our granddauthers ages 8, 13 16. We all had a wonderful time. Each girl was granted her "bonus" wish to swim with the dolphins, zip line, and ride horseback. All were great! The ocean was only ten yards away from the lanai and we enjoyed many sightings of whales and dolphins. The condo and ameneties are first class and everyone had plenty of "apace". Condos at Kanaloa at Kona are pretty mush isolated, but are only a few minutes from snorkel and wave beaches, Kailua, and a Walmart. The condo was well equipped with snorkel gear, boobie boards, binocs, etd. Kanaloa at Kona Condo 2003 is a comfortable and clean place with a wonderful view of the ocean. We loved that the kitchen is well-equipped and that the fans cool the rooms very well. The location is ideal: very close to the shore and a shoreline path and a short drive to a large grocery store, farmers' markets, restaurants, and tourist attractions. We loved being able to cook our own meals and enjoy them on our private lanai, watching the ocean and the sunset. The owner was considerate in providing a binder of information as well as guide books. We felt well-oriented to our surroundings. We had the ideal stay in Condo 2003! Nine days of absolute comfort and beauty! The view is amazing - seeing whales and dolphins. The condo is perfectly appointed, clean, and welcoming. The owners have done an outstanding job of updating everything with the best choices. From the reservation to after our stay, everyting was easy and completely informative. We walked right in and felt right at home! Thank you so much for making it available! We would definitely stay here again - as often as possible! We rented this condo for a week in January 2012, five adults. The pictures don't do the view justice. We practically lived on the deck enjoying the close-up view and sounds of the crashing waves. We saw dolphins and even a couple of whales from the deck. It was just perfect. The condo itself is very nicely appointed with a lovely new kitchen and all the amenities you could want. There was even boogie boards and snorkle equipement, soap, towels etc. for the bathrooms just like a nice hotel and a welcoming gift basket. There was plenty of space for everyone and we ate at home every morning and about half the evenings. Also, everything was exactly the way the said it would be and the directions for getting there, checking-in etc. were right on. You can't go wrong with this condo. Amazing Location! Have traveled a lot through the years and never felt closer to the ocean. Large lanai with spectacular views. Enjoyed the sunset every evening.You can tell the condo is well taken care of and very well equipped for guests. Beach towels, coolers in a variety of sizes, beach chairs and mats, flashlights and did I mention even a garlic press in the kitchen drawer! The owner seems to care that you have everything that you may need. Kitchen was very well equipped with the necessities. The grounds were also well taken care of with an amazing location for the beach swimming pool. I would highly recommend this condo and location to any visitors to the Big Island! We were a family of four with two teenagers. This Condo will not disappoint - direct oceanfront, unbelievable view, spacious, and, best of all, it's one of the few totally upgraded and modernized units at Kanaloa. Pure Luxury! Great condo. Nicely remodeled, furnished and well-appointed. We really appreciated the extras: beach mats, sand chairs and umbrella, good washer/dryer, a rice cooker (yay) etc. We've been going to Kanaloa for almost 20 years and this is one the nicest units we've stayed in. This unit does get hot in the afternoons though so if you are sensitive to heat, you'll need to purchase air conditioning. Reviewed by Great location and very comfortable. We had a fantastic holiday - the Condo was spacious and well outfitted. The guide book left for guests was very useful as was the spare boards and snorkelling gear (a bonus we didn't expect). And that view - just beautiful ! Definitely recommend this for a great holiday. Incredible condo nearly on top of the water! Large, clean, well-furnished for meals at home and relaxing at the end of the day, big-screen TV w/ DVD, wireless internet access, stereo to play iPod on. Phenomenal lanai and view, great pools and grounds. Less than 5 minutes from a fantastic snorkeling beach with awesome fish and turtles, and surfing lessons, Would definitely stay again! The science veiw was fantastic. The condo was clean and had lots of space. The stairs were hard to climb for one couple. Really appreciated the layoout and the location of the condo. I would recommend to anyone. The oceanfront location of this property was worth every penny! It was absolutely beautiful. The lanai was like our family room; every meal, sunrise and sunset! Very spacious and we were provided with all the amenities required for a perfect holiday! We stayed in four different condos during our Hawaii vacation and this was our favorite. The view is amazing, exactly like the pictures. We saw some dolphins from the balcony. I'm super sensitive to motion sickness and I think just sitting on the balcony and staring at the water below actually got me sick! I've had many oceanfront rooms, but nothing this close to the water before.The amenities are great. The bathrooms are newly redone and the master especially is huge. The kitchen has plenty of counter space and a nice granite top. It was nice staying here since everything was very clean and not outdated. The condo is very well stocked. The owners are very thoughtful in providing some local recommendations. We stayed in November and definitely needed aC, but we're also from the Northeast, so we're used to cool weather. The pool by the ocean was nice and not crowded.I would definitely stay here again and highly recommend it to anyone considering this unit. Amazing ocean views from the lanai of this recently renovated, super clean and spacious condo. We were there with our two very active teenagers which worked because there were plenty of things to do within a short drive. "Sea Quest" and "Sea Paradise" do adventure snorkeling from a nearby bay (5 minutes away), the night manata ray dive (wow!) and Captain Cook/Honaunau Bay/Black sand beach/ocean front caves (amazing). The drive to the beaches is farther. There is no beach at this resort. We decided to go to Hapuna Beach, very beautiful, but about a 45 minute drive...White Sands Beach is closer, smaller and more crowded . Great four wheel driving is about 70 minutes south to the Green Sand Beach and The Road to the Sea (a black sand beach) - really fun! The volcano!! - what more can you say! A two hour drive and really worth it. Our Condo owners thought of everything, including flash lights for the Thurston Lava tube which is really dark in the undeveloped back part. If you are planning to be out and about this condo is for you. The downside is the ocean side pool is closed for renovations, which we did not know about. There is another adult pool that is not ocean side. The unit itself - has everything except a grill on the lanai. New bathrooms, (very nice new tiles with turtles and fish), comfortable beds, good air conditioning (an extra charge), nice marble countertops in kitchen and baths, a loft and a spacious family room (ocean views) with new flat screen. We will go back! We were more than pleased with everything at Condo 2003. It was comfortable and clean, and provided ample beds for our needs. The lanai was the "place to be", where we thoroughly enjoyed the beautiful view and sounds of the ocean waves crashing against the lava. The whole complex was well-tended and everyone was very kind. We'd like to return with our adult children some day. Our family of 6-with 4 teenagers-absolutely loved this condo, and the resort as a whole.The condo was equipped with everything you could possibly imagine,from beach chairs and cooler bags to fully equipped kitchen(better equipped than mine! )to internet and stereo system for the ipod, to games and books to read.Even beach shoes!With 4 teenagers it was a bonus to have 3 bedrooms,and all the beds were very comfortable-the master was a dream!There was plenty of room in the condo, and a lovely big lounge as well as 2 recliner rockers, so enough space for everyone when chilling out in front of the tv.The bathrooms were very luxurious,the master bathroom spoilt us all-HUGE double shower was fabulous.Enormous walk-in robes in bedrooms meant we could unpack our luggage and feel as if we were in our home, without tripping over opened suitcases on the floor of the bedroom.Being on the upper floor made it a pain to carry suitcases up the stairs, but we only had to do that once, and it was well worth it for the view from the lanai.It was so relaxing sitting there, day or night, looking at or just listening to the water.It really was worth paying for something that was almost on the water with such spectacular views.The resort itself is beautiful, it was fairly quiet when we were there, had the pool to ourselves on most occasions.We went for a walk along the front of the resort, quite amazing, but rough on your feet if you only have thongs on.You should also walk to the golf course, quite beautiful.We did some grocery shopping at nearby Keauhou Gardens shopping centre, and also ate at a couple of the restaurants there-good food and not expensive.We had 6 night there,and filled the days with lots of activities,so didn't get to spend a lot of time just relaxing at the resort,but we could have easily spent another week there just enjoying the facilities and the condo.If we are ever lucky enough to get back there,we would certainly stay at this condo again. Thank you so much for your attention to details. The condo is tastefully decorated and has a well stocked kitchen. We fully enjoyed our time there. Most photos we look at for place to visit have usually not turned out as great as they look.This place was a wonderful surprise and the photos were what sold us on trying it out!Glad we did!!! 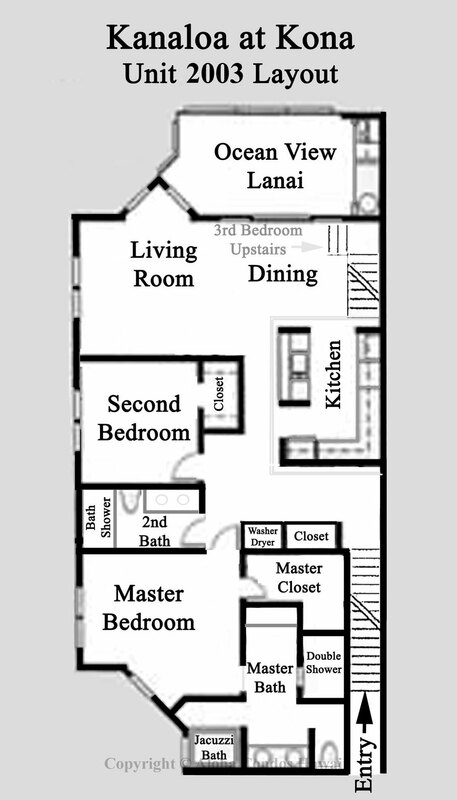 We stayed in Unit 2003 at Kanaloa at Kona for ten days with our daughter and her family. The condo was spacious and clean and provided comfort for our whole family. We spent a great deal of time on the lanai, which was practically in the waves! It was so relaxing to watch the waves crash on the rocks and view the beautiful sunsets. We also used the ocean view pool every day and enjoyed the facilities there. It was nice to have a shower right there for a quick rinse off after swimming. A very nice BBQ was located just across from our unit and we met some nice people while we cooked dinner each night. It was a bit of a drive to a white, sandy beach, but the one across from the Veteran's Cemetary just north of the airport was fantastic. Great snorkeling, beautiful, clear water, and gentle waves in which to play and swim. We also had a great fresh ono dinner at Quinn's, which I would highly recommend. All in all it was a delightful vacation and we would definitely return to Unit 2003 again in the future! The whole process was very easy. The home was very clean, spacious and the air conditioning worked great. The location you can't beat which is right on the ocean and amenities were great. Having the Keauhou Shopping Center just up the road was so convenient to get a bite to eat from the many restaurants or picking up a few necessities from the drug store and grocery store. The sunsets were simply BEAUTIFUL! I have recommended your site to my friends and family and will be definitely returning again. We were looking for a 3 bedroom sea front property and they appear to be few and far between anywhere in the Hawaiian Islands. This property just managed to fit the bill, although the 3rd bedroom was basically a room on a mezzanine floor, with little privacy. However, we were aware of that before we booked, so we are not complaining. That room did get very warm, so we went for air conditioning, which was fine. The sea facing balcony had a lovely lounger and some a nice dining table and chairs, not those cheap plastic ones. It was nice and quiet for our stay, but a family did stay in the flat below one evening and you were very aware of their conversations when sitting out on the balcony. There was plenty of towels etc. and we had everything we needed. The property is nicely furnished and clean. The one thing I was not happy about, was $165 for the cleaning fee. To me, that's a heck of a lot of money just to keep the place clean. Again, we knew that before we booked, but that cost is more than excessive to me. If your thinking of staying here, I would advise that you get a car. There is a nice restuarant on the complex, but if like me, you like a choice, you need transport. There is a shopping Mall a short drive away, but its a good 15-20 minute uphill walk away. OK coming back, its downhill then! The complex does have 3 swimming pools, but none of them had much in the way of shaded area's. My family love sunbathing, but I'm not so keen. There was the odd umbrella, but even under them the sun beats thru and you could easily burn if you are not careful. One gripe, you can only drink your drinks at the bar and not round the pool, which I did not agree with. I like to sip my drink whilst laying round the pool, not sitting up at a bar. I suggest that they get some plastic tumblers and let people enjoy themselves. Spacious and right on the ocean! This condo is so much larger and more open than many I've stayed in. The third bedroom loft was perfect for the kids (but the beds upstairs were uncomfortable I hear). The master bedroom was very nice and the remodeled bathroom was beautiful! The kitchen was in need of also being remodeled and updated. The grout was pretty old and not terribly clean. Also the ivory carpet in the master bedroom was very old and grungy. The condo is really fabulous and the Kanaloa at Kona grounds are spectacular! Thanks for a great trip! This property had every amenity that you could need. It was comfortable, beautifully decorated and very spacious. We had an ocean front view that was by far the best we've ever had. I always insist on an ocean front or ocean view unit and this was about as close to the ocean as you would want to be. At times, I had to close the slider door to be able to hear the television in the evening. But I wouldn't trade it for anything. The ocean was beautiful. Our only regret is that this condo is not on our favorite island of Maui. We enjoyed the Big Island but perfer the more goings on of Maui. This unit is great and the grounds of this complex are beautiful. If we ever come back to the Big Island, this is where we will stay.